This modification changes how the treasures are displayed in messages when you hover your mouse over a treasure or when a treasure has been recovered. 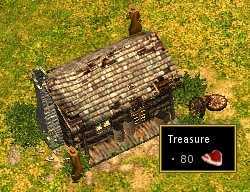 Message displayed when hovering the mouse over a treasure. A treasure recovery displayed in chat. You can download the treasure mod here. The package contains a readme file with installation and uninstallation instructions. Treasure mod is based on Ensemble Studios' stringtablex.xml file. This mod is not compatible with Xentelian's Enchanced Text Details mod because they modify the same file. This mod is for English versions of the game only. If you use this with non-English versions, your in-game texts will be displayed in English.